The volumes 1 + volume 2 from the collection The Orishas Book For Children: Knowing the Orixshas + Exu, two friends and a fight! The volumes 1 + volume 2 from the collection The Orishas Book For Children, to teach children since first ages the traditional values of African-based religions while they have fun with the African Gods. Order the collection package "Knowing the Orishas + Eshu, two friends and a fight" right now! In a country as plural and mixed as Brazil, we find faith and ax in every corner: in the colors of cities, in the songs of radios, in the foods of saints and men. In day-to-day life, Ogun and St. George become one; Yemaya, Queen of the Sea, blesses all beliefs at the turn of the year with flowers by the sea; and the Ibejis, ah! the Ibejis ... Sweet sacred children, delight in the carurus to celebrate the joy of living! 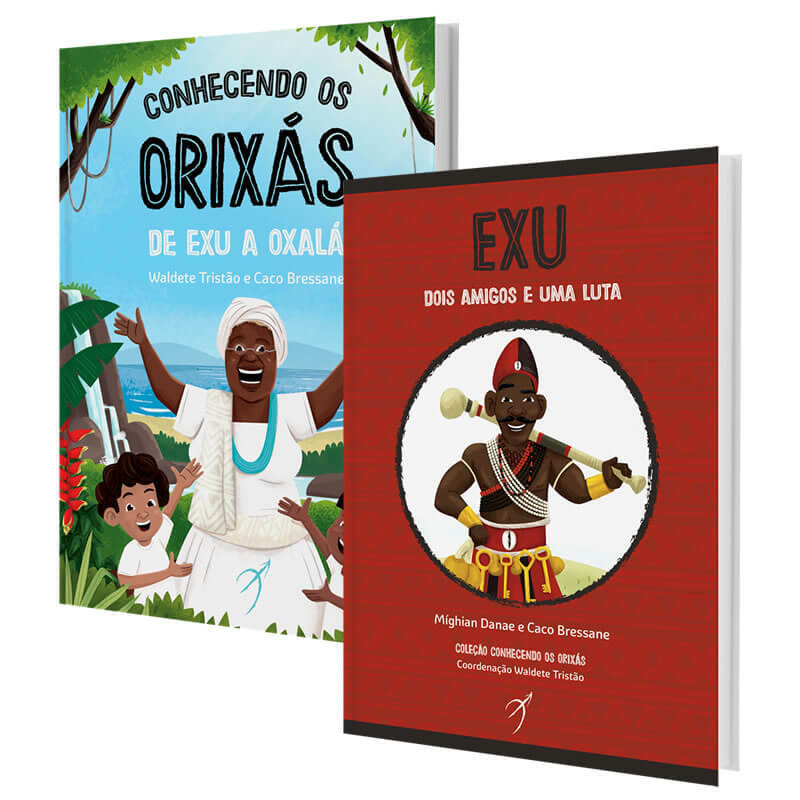 Composed of 18 books, the collection "The Orishas Book For Children" presents in simple and fully illustrated language who are the Orishas worshiped in Brazil, its characteristics and traditional myths. In "Knowing the Orishas", volume 1 of the collection, children will be able to know who they are and what the main characteristics of the main Orixás, their colors and predileras, their greetings and powers of nature that each one commands. In the second volume, "Eshu, two friends and a fight", they will meet one of the most famous legends of Eshu, the Orisha of communication and movement: the Guardian of the Crossroads teaches the importance of praising him first, making two inseparable friends live a great adventure in defying the laws of the gods, and yet it shows that the truth ... ah, the truth ... It is one, even when it has two sides! In the next volumes of the collection, which will be released gradually between 2019 and 2020, each Orisha will be highlighted with one of its traditional stories, specially adapted for children of literacy age, teaching fundamental values ​​about friendship, respect for differences, love, family, generosity, identity, self-esteem and more!